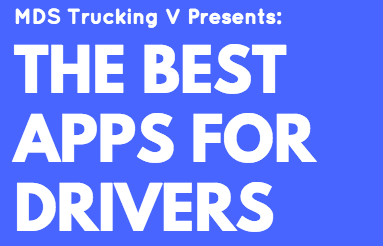 Download These Top 5 Apps for Drivers! At MDS Trucking V we like to stay on top of the latest technological trends in the trucking industry. Doing so helps us ensure continued fast, efficient and reliable service for our customers. Like most industries, changes in trucking technology in the past decade have revolutionized the way we all do business. Jobs once completed manually in hours are now done with automated technologies in minutes if not seconds. Without a doubt, mobile apps for smartphones and tablets have been at the forefront of advancements in our industry. Many apps exist to make driving easier, efficient and more productive and we've assembled a list of five of the best. Discover them below and let us know if we missed any of your favorites!